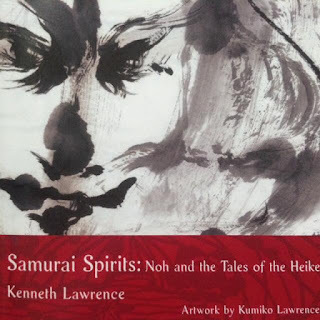 Soju Projekt recently published a booklet, 'Samurai Spirits: Noh and the Tale of the Heile,' that features my retelling of two Noh plays and Kumiko's sumi paintings. Both plays are based on stories from the 'Heike Monogatari' (Tales of the Heike). In 'Sanemori,' the spirit of a samurai warrior killed in battle, drawn by the sound of chanting, seeks relief for the suffering of his soul. In 'Kiyotsune,' a samurai warrior who has taken his own life returns to offer solace to his suffering widow. These masterpieces are two of the most touching pieces in the Noh repertoire.